A comprehensive look at what it really takes to lead transformation successfully, written by two of the “masters of the craft.” The author’s best-selling first edition has been significantly updated to deliver critical insights about how leaders can achieve breakthrough results from transformational change, even in these challenging times. 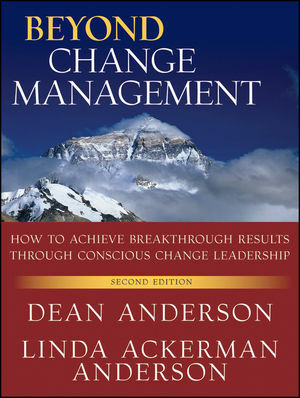 The book introduces conscious change leadership and provides insights about the critical human and change process dynamics that leaders must be aware of in order to succeed, and reveals why most leaders do not see these dynamics. Most importantly, it highlights the shift in worldview leaders must make to deliver greater success. The book outlines the author’s highly successful “multi-dimensional, process approach” to transformation, addressing change at the organizational, team, relational, and personal levels. It thoroughly addresses leadership mindset and behavioral modeling, culture change, and large systems implementations, providing best practices developed over three decades of successful consulting to Fortune 500 executives. Written for executives and managers, OD consultants, change managers, project managers, and change consultants, this must read book provides the foundation for successful change leadership and consulting. Beyond Change Management advances the field of change leadership, and takes the concept of managing change in organizations to a whole new level. It is a must read for anyone wanting to stay abreast of advancements in the field. Together with its companion volume, The Change Leader’s Roadmap: How to Navigate Your Organization’s Transformation, these books can be used as texts in corporate or graduate school training programs and courses.